Posted on 03/13/2016 in Game Recaps. 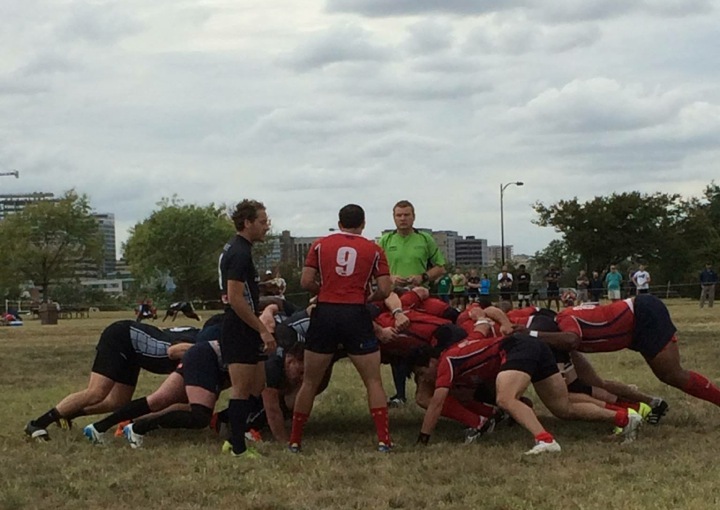 The Potomac Exiles traveled to Rosecroft Raceway to take on the Washington Rugby Club in a preseason friendly. With a new coach, and a lot of new faces in the backline, the visitors were off to the races early with a second minute score from winger Mike Tillman, no doubt powered by his Royal Rugby Boots. Fly half Conor Mannix dotted down a strategic kick from scrummy Matt Quigley, and Iseijah “Juice” Allen highlighted the first period with a hat trick. Potomac ran away with this one early, with at least eight different players seeing pay dirt throughout the day. D3 standouts from the fall Rob Black and Dom Smith got their first looks with the D1 lineup, and many fresh faces performed well for the coaches with Tillman, Alfred Beatty and Julian Zivkovic showing off the speed on the way to their first Exiles’ tries. Potomac showed a lot of athleticism on the day, and will continue to reign in the new gameplan and structure before their first league match March 17th.